Heck yeah, THE EAGLE HAS LANDED! Oh, man, what a great film! Modest, sure. Simple, yep. Under-ornamented, perhaps. But a beautiful story, well told, well acted and, SPOILER ALERT: when Eddie nails that landing at the end, OMG, tears streamed down my cheeks into buckets, "AND THE CROWD GOES WILD!" As for nits, it could have run a smidge longer. They could have milked the final bit for ten minutes more and we woulda all been glad. They coulda done some MONSTROUS music placement, all circa 1988. 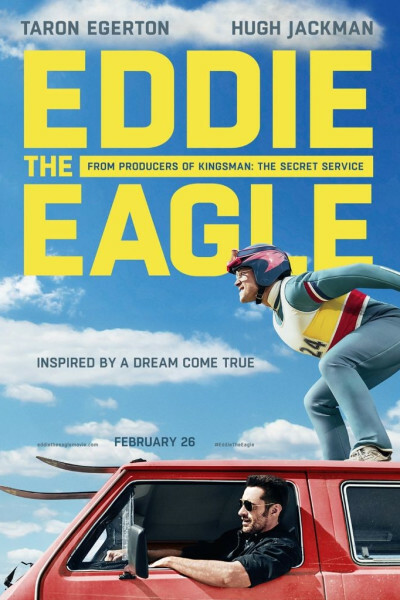 In the hands of Stallone, l'il Eddie the Eagle coulda been Rocky for a whole new generation. Alas, on the whole, jeepers, it's still a really great feel-good story—and the sort for which I'm an absolute sucker. Very Pygmalion Effect; He who is Last coming in First; lotsa "Rudy-like" moments, etc. etc. If you're looking for a great 'date' movie, look no further. If you're considering it for a 'family' movie, well, there's a brief allusion midway through that invokes Bo Derek—and which might induce some squirming—but it passes after a couple minutes and we're back on the ramps. p.s. Taron. Nice turn here, mate. Much better than Kingsman. Thank you. You stand redeemed. Please don't do Kingsman 2. Set it down; walk away.